The motorcycling world would be very different if it hadn’t been for the sports moped boom sparked by the ‘sixteener’ legislation of 1971. Although Puch was probably the first manufacturer to produce a sporty 50, complete with the all-essential set of virtually unusable pedals, Yamaha’s SS 50 (for Sixteener Special) followed quickly by its derivative, the legendary FS1-E, was the one everyone wanted. The SS 50, the daddy of the FS1-E, sold in 1972 and is urguably the most collectable of all, being much rarer than the FS1-E that superceded it in 1973. But it was then that sales really took off, averaging about 15,000 per year until 16-year-olds were forced onto ‘slopeds’ in 1977. While restricted Fizzies still sold well, the fledgling stage of motorcycling was losing its attraction, which had a knock-on effect that almost certainly contributed to the general decline in two-wheeler registrations during the 1980s. Many of today’s bikers are the very same people who first ventured onto the roads the L-plates sellotaped to the suspension of FS1-Es, hence the nostalgia-fulled surge in prices in recent years. Despite huge moped sales, the survival rate is low, so the best examples can be worth 25 times their original price tag. Early models were Candy Orange and had SS on the side panels. 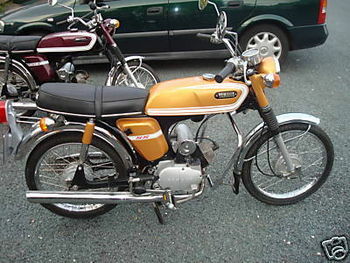 Honda already sold an SS50, so they objected, hence the FS1-E sticker on later versions. ‘E’ stood for England. Probably one of the easiest engines to kick start ever made! Pressed steel frames are prone to damage and can suffer from the same corrosion as old cars. This page was last edited on 21 January 2011, at 18:40.